Walking along the streets of Willemstad, you can find Jewish influence all around you. One of the most popular sights is the Mikvé Israel-Emanuel Synagogue, which is the oldest, continually used, synagogue in the Western Hemisphere. But the Jewish influence on this beautiful small island goes much deeper than those walls. It all started in Spain when the country was still half Christian, half Moorish. Living among those two religions were the Jews, known as Sephardi Jews. In 1492, the Sephardi Jews experienced a big attack on their religion. The Edict of Expulsion started and together with the Moorish people, they either had to leave Spain or convert to Christianity. The majority decided to flee the country to a place where they felt safe to practice their religion. Those who stayed behind, converted to Christianity (“Conversos"), but of course, this was just an act of appearances. In between the safe walls of their home, they still secretly practiced their religion until the Holy Inquisition in Spain, which again targeted the Jews. Every "ex-Jew" who they thought was straying from Christianity was cruelly tortured until they made a confession. This confession would not only mean their execution by burning but also that of their family and friends. This ritual of public punishment was called auto-da-fé, meaning an act of faith. To escape prosecution, a lot of the Conversos decided to cross the border and settle in Portugal, which at that time was still soft on Jews. At the end of the 16th century, the pressure on the Conversos in Portugal became too strong and again they had to seek for a new place to call home. During the 15th and 16th centuries, many Jews left Spain and Portugal to live in Amsterdam, where freedom of religion was a high priority. This was their first tie to the island, as Curaçao would later become a Dutch colony. The colonization of the island led the first Jew, Samuel Cohen, to set foot on the island. It was July 29th, 1634 when Samuel Cohen, a translator on board of a Dutch ship, came to Curaçao as part of the mission to seize the island from the Spaniards. The Dutch then used Curaçao as their naval base to attack Spanish fleets. After the Peace of Westphalia/Peace of Münster, the island no longer had any use and the Dutch contemplated leaving the island. But first, the West Indian Company decided to check if there was interest among Dutch citizens to build a life on the island. The primary selling point they used, was its agricultural business opportunities. Still, the interest remained low. It was in 1651 that the Portuguese Jew Joao d'Yllan accepted the offer being made by WIC. He promised to bring 50 settles with him, but he only brought 12 settlers and most of them were Jews. Joao had experience with agriculture, but he did not succeed as a farmer. Later, a larger group of Jews from the same congregation, lead by Isaac da Costa, came to the island to start an agriculture business. He also failed to succeed and so they all moved to the city. With their connections and expertise, they started importing goods from Amsterdam and other harbor cities to sell these on the island. The Jewish community on Curaçao grew more and more and so did their wealth. To this day, many well-established stores in the city (and outside) are of Jewish descendants. At the beginning of the 19th century, the Jews started branching out into other industries. The families Jesurun, Naar and Maduro, released their own silver penny and started with the production and circulation of their own paper currency. The Jewish firm Maduro & Sons was also responsible for the demolition of the city walls of Willemstad. In exchange, they received part of the land that would be exposed after the demolishment. That area was called De Ruyterkade and Prinsenstraat and part of that area is nowadays called Madurostraat. They were also successful in the shipping industry. S.E.L Maduro & Sons, a very well-known Jewish company, was responsible for building the first oil tanker that traveled from Maracaibo (Venezuela) to Curaçao. One of the notable influence of the Spanish/Portuguese-Jewish community in Curaçao, is in the local language. Commonly, the local language Papiamentu is considered either an Afro-Portuguese creole or Spanish-based creole. In the language, you will find many Spanish and Portuguese words. Even the name island name, Curaçao, is possibly a derivative of the Portuguese word coração, meaning heart. The Senior family was once part of the Conversos in Spain, that eventually fled to the Netherlands and Brazil. Several sons of Mordechai Senior, who was born in Amsterdam in 1620, emigrated to Curaçao. Edgar Senior, our founder, was one of the descendants of this family. Like many families on the island, they were also an important family for Curaçao. Together with his partner Haim Mendes Chumaceiro, Edgar Senior ran a pharmacy in the city called Botika Excelsior. This is where he first started producing the Senior Curaçao Liqueur. The marks the Jewish community left on Curaçao, and continues to do so, are visible in every corner of the island. You can find it in the street names, the language, the buildings and industries like finance, shipping, the production of the world-famous Curaçao liqueur and so much more. 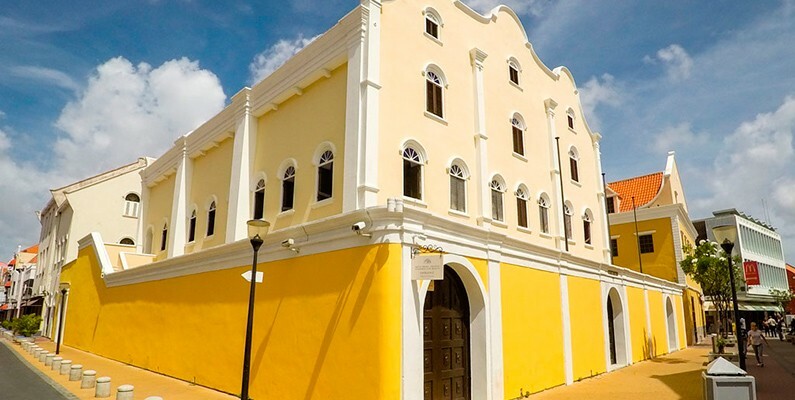 A Curaçao without our Jewish community is pretty much unthinkable.